Heat the butter in an 8-inch skillet over medium heat. Add the brown sugar and lemon juice and cook and stir for 1 minute. Add the peaches and cook for 1 minute, stirring occasionally. Remove the skillet from the heat. 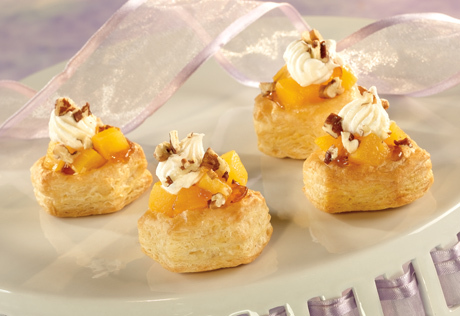 Spoon the peach mixture into the pastry cups. Top with the whipped topping and sprinkle with the pecans.